This week's graph comes from the Economist as another verification of my earlier ideas on the causes of eurozone contagion. LOTS of countries in the rich world ran pro-cyclical current-account deficits before the financial crisis hit, which is to say they borrowed heavily when times were good. Yet only a handful have seen yields on their sovereign debt spike to alarming levels. One reason for this, as the chart below shows, may be an over-reliance on fickle foreigners to finance those deficits. 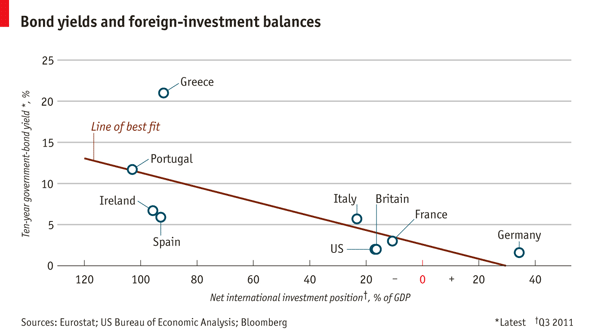 Italy, which has a high rate of domestic savings (and thus is less reliant on finance from abroad) and yet also suffers from high yields on its debt, is an outlier." I would add that the key reason why foreigners financed the CA deficit is linked to the common currency and the banking regulations which led to a levelling of spreads across the eurozone. This essentially meant that Greece and Germany for example, could borrow at the same cost. Despite having the same zero-risk status and low interest rates, investing in the periphery became more attractive than investing in the North simply due to an attractiveness of a new market. And when this new market is considered to be risk-free, all the better! other data, is there any other website which provides such data in quality? As i can do reword my paragraph my own so you can also do this with the help of our services. Are you a Social Darwinist?